Illustration of the Battle of Fallen Timbers, one of many Ohio Indian Wars. The Ohio Indian Wars were a series of struggles between settlers from the newly independent United States and American Indian residents of the Ohio Country in the years after the American Revolution. During the first part of the eighteenth century, French and British colonists began to migrate to modern-day Ohio. Each group sought to form alliances with American Indians in the region. With France's defeat in the French and Indian War, Great Britain acquired this territory in 1763. The British government attempted to improve relations with the American Indians already residing in the Ohio territory by prohibiting white settlement in the Ohio Country. Great Britain's action resulted in part in the American Revolution. The Treaty of Paris (1783) brought the Revolution to a close and Great Britain recognized the independence of the United States. In addition, the new nation secured all of the land east of the Mississippi River except for British possessions in Canada and Spanish territory in Florida. The American Indians in the Ohio Country took no formal part in the treaty negotiations. Great Britain made little effort to include their American Indian allies in the treaty's terms. Despite this, the British did not abandon the American Indians. They continued to trade guns and other European manufactured goods for native furs. The British hoped that the American Indians, with British weapons, would stop the westward expansion by the newly independent United States. Unfortunately for the American Indians, U.S. settlers moved quickly into the Ohio Country at the end of the Revolution. After the signing of Treaty of Paris, settlers faced few obstacles in moving to the Ohio Country other than from the American Indians themselves. The conflicts that followed became known as the Ohio Indian Wars. During the late 1780s, the Northwest Territory was a violent place as U.S. settlers moved onto land that several groups of American Indians had long claimed as their own. The United States government lacked the funds to equip an army to deal with the so-called American Indian threat adequately. Henry Knox, the Secretary of War, requested that Arthur St. Clair, the governor of the Northwest Territory, establish a peaceful relationship between the settlers and the American Indians of the region. St. Clair called for a meeting with American Indian leaders to negotiate an agreement. The meeting took place at Fort Harmar and began on December 13, 1788. The American Indian nations present included representatives from the Wyandot, the Delaware, the Ottawa, the Chippewa, the Potawatomi, and the Sauk. These attending American Indians hoped that St. Clair would agree to establish an American Indian reservation consisting of the land west of the Muskingum River and north of the Ohio River. St. Clair refused and demanded that the American Indian leaders agree to a reservation boundary established by the Treaty of Fort McIntosh in 1785. Under the Treaty of Fort McIntosh, Ohio's American Indians were to relinquish their lands in southern and eastern Ohio. They were confined to the western corner of modern-day Ohio with a border that roughly followed the Cuyahoga River on the east. A southern border extended from modern-day Akron west to the Tuscarawas River, south to Fort Laurens, then west to Pickawillany on the Miami River. A western border ran north from Pickawillany to the St. Mary's River and then to what is now Ft. Wayne, Indiana. A northern border from Fort Wayne to Lake Erie followed the shore of the lake east to the Cuyahoga River. St. Clair told the American Indians he would attack them if they refused to abide by the Treaty of Fort McIntosh. He also sought their friendship with three thousand dollars in presents. The American Indian leaders signed the Treaty of Fort Harmar, which reiterated the terms of the Treaty of Fort McIntosh, on January 9, 1789. The Treaty of Fort Harmar did little to stop the bloodshed between the United States and the American Indians. Many of Ohio's American Indians refused to honor the treaty, including the Shawnee. They claimed that the groups represented at the treaty negotiations did not speak for them. Warfare increased, especially in the western portions of modern-day Ohio. Most of Ohio's American Indians had been driven from the eastern portion of the state during the American Revolution, although many American Indians still hunted in this area. In 1790, Josiah Harmar, commander of the U.S. army in the Northwest Territory, was stationed at Fort Washington (present-day Cincinnati, Ohio). Henry Knox, the Secretary of War, ordered Harmar to end the threat of American Indian attack in western Ohio. Harmar marched from Fort Washington with 320 regular soldiers and roughly 1,100 militiamen, primarily from Pennsylvania and Kentucky. The militiamen were poorly trained, many did not know how to correctly load and fire a musket, and some did not even have a gun. Harmar was to destroy American Indian villages near modern-day Fort Wayne, Indiana. He intended to attack the Miami, the Shawnee, and the Delaware, along with the villages of other American Indian peoples located in western Ohio. Many American Indians fled their villages as Harmar's army approached. The U.S. forces burned several villages, but the American Indians regrouped. On October 20, the natives, led by Little Turtle, attacked a detachment from Harmar's army led by Colonel John Hardin. Hardin's force consisted of several hundred militiamen and a few regular soldiers. Hardin led his men into an ambush. Most of the militiamen fled the battle. The regular soldiers put up a brief resistance, but the natives killed many of them. Some of the retreating militiamen did not stop until they crossed the Ohio River into Kentucky. Harmar sent another detachment after Little Turtle's warriors two days later. Once again, the natives inflicted heavy casualties upon the U.S. forces. Harmar immediately retreated to the safety of Fort Washington. He had lost 183 men killed or missing in this campaign. It became known as Harmar's Defeat. Harmar's actions in western Ohio only heightened tensions between the white settlers and the Native Americans. Following Harmar's defeat, American Indians attacks against settlers increased. In 1791, Arthur St. Clair led another campaign against the American Indians in western Ohio, hoping to succeed where Harmar had failed. To protect settlers and to force the American Indians to abide by the Treaty of Fort Harmar, Arthur St. Clair ordered the construction of forts in what is now western Ohio. St. Clair moved against the American Indians living near present-day Ft. Wayne, Indiana. His men left Fort Washington on September 17. The men marched twenty miles in two days and then built Fort Hamilton. St. Clair's army then advanced forty-five miles northward, where his men built Fort Jefferson. Leading primarily untrained militiamen, St. Clair faced problems with desertion from the beginning of his campaign. Although it was still early fall, his men faced cold temperatures, rain and snowfall. St. Clair also had a difficult time keeping his soldiers supplied with food. His men became demoralized. Despite these problems, St. Clair continued to advance against the Miami. By November 3, his men had arrived on the banks of the Wabash River, near some of the Miami villages. Little Turtle led his warriors against the U.S. forces on the morning of November 4. Many of the militiamen under St. Clair immediately fled. St. Clair led the regular soldiers in a bayonet charge. St. Clair had two horses shot out from under him. Several bullets passed through his clothing and one took off a lock of his hair. The American Indians surrounded the U.S. forces' camp. After three hours of fighting, the U.S. regulars fought through the American Indian lines and began a lengthy retreat. The survivors reached Fort Jefferson late that afternoon and evening. With limited quantities of food and supplies at Fort Jefferson, St. Clair ordered his forces to Fort Washington. The American Indians had soundly defeated St. Clair's army. President George Washington demanded that St. Clair resign from the army. St. Clair did so on April 7, 1792, but remained governor of the Northwest Territory. He still faced problems with American Indians in the region. St. Clair's Defeat was one of the worst in the history of the United States Army at the hands of American Indians. In 1792, President George Washington appointed Anthony Wayne as the commander of the United States Army of the Northwest. The major purpose of this army was to defend U.S. settlers from American Indian attack. Washington hoped that Wayne would prove more successful than Harmar and St. Clair. Wayne arrived at Fort Washington with additional troops in May 1793. Wayne wanted to move against the American Indians immediately, but small pox and influenza weakened his men too severely. In October, Wayne finally left the Cincinnati area and headed to Fort Jefferson. He proceeded six miles to the north of Fort Jefferson and ordered the construction of Fort Greene Ville. His army remained there during the winter of 1793-1794. He also ordered his men to build Fort Recovery on the site of St. Clair's Defeat. With Wayne advancing into American Indian territory, tensions escalated between the U.S. and the American Indians during the summer of 1794. On June 30, 1,500 Shawnee, Miami, Delaware, Ottawa, and Ojibwa led by Little Turtle attacked a supply train leaving Fort Recovery for Fort Greene Ville. In late July, Wayne moved into the heart of Ohio's American Indian territory. In early August, he had his men construct Fort Defiance to protect his army as well as to serve as a supply depot. During this time period, Wayne's men also destroyed native villages and crops. Believing that the American Indians should seek peace, Little Turtle refused to lead the tribes into battle and deferred to Blue Jacket, a Shawnee leader. 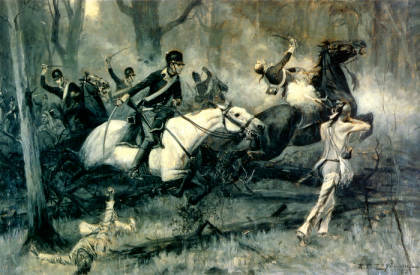 As Wayne moved toward the Maumee River, the American Indians prepared to attack him at an area known as Fallen Timbers. It was a place where a tornado had knocked down many trees. The American Indians expected the U.S. forces to arrive on August 19, but the white soldiers did not arrive until the next day. The American Indians fasted before the battle to avoid having food in their stomachs. The likelihood of infection increased if a person was wounded in the stomach and there was food in it. By August 20, however, the American Indians were weak from hunger. Although the American Indians used the fallen trees for cover, Wayne's men drove them from the battlefield. The U.S. forces had thirty-three men killed and roughly one hundred wounded, while the American Indians lost approximately twice that number. The fight became known as the Battle of Fallen Timbers. Blue Jacket's followers retreated to Fort Miami, hoping that the British would provide them with protection and assistance against Wayne's army, but the British refused. Wayne followed the American Indians to the fort. Upon his arrival, Wayne ordered the British to evacuate the Northwest Territory. The British commander refused, and Wayne decided to withdraw to Fort Greene Ville. For the next year Wayne stayed at Fort Greene Ville, negotiating a treaty with Ohio's American Indians. The American Indians realized that they were at a serious disadvantage with the U.S., especially because of Great Britain's refusal to support the American Indians. On August 3, 1795, the Treaty of Greenville was signed. Representatives from the Miami, the Wyandot, the Shawnee, the Delaware, and several other nations agreed to move to the northwestern corner of what is present-day Ohio. Not all American Indians agreed with the Treaty of Greenville, and bloodshed continued to dominate the region for the next twenty years as the Anglo-American settlers struggled to force Ohio's American Indian peoples from the regions. Tecumseh, a Shawnee leader, posed the most serious threat to white settlement of the Northwest Territory and the state of Ohio during this period. Tecumseh decided that the best way to stop white advancement was to form a confederacy of American Indian nations west of the Appalachian Mountains. Tecumseh believed that no single group owned the land and that only all American Indians together could turn land over to the whites. He also believed that, if the American Indians united together, they would have a better chance militarily against the U.S. In his quest, Tecumseh received assistance from his younger brother Tenskwatawa. Known as the Prophet, Tenskwatawa believed that the natives had to end their reliance on U.S. goods, such as alcohol, iron cookware, and guns. The American Indians had angered the Master of Life by becoming dependent on these items. If they returned to traditional customs, the Master of Life would reward his followers by driving the U.S. settlers from their land. Many American Indians found the Prophet's message appealing and began to gather at his village, Prophetstown, in the Indiana Territory. Tecumseh used his brother's influence to convince American Indians in the region to put aside their traditional differences and unite together against the whites. He also visited many of the American Indianswest of the Appalachian Mountains and east of the Mississippi River seeking additional people to join his confederation. While most tribes listened to Tecumseh's proposal, many rejected his idea. This especially was true of American Indians in modern-day Tennessee, Georgia, and Mississippi. Many of these natives, unlike those in the Ohio River Valley, faced no real encroachment on their lands by the U.S. They also accepted white products and customs and did not want to lose access to these goods. Tecumseh had more success in Ohio, Kentucky, and the Indiana Territory. These were areas that whites had attempted to settle since before the French and Indian War. Tecumseh's Confederacy failed. Many American Indians refused to end their trade and friendship with the U.S. The whites also greatly outnumbered American Indians in the region, and had greater access to firearms and ammunition. As Tecumseh's followers began to converge at Prophetstown, he also could not provide them with adequate food and shelter. To acquire white goods, the natives had engaged in the fur trade with the U.S. This trade greatly diminished the animal population and left the natives with less to eat. In 1811, William Henry Harrison led a U.S. army against Prophetstown. Tecumseh was away seeking allies in the southern part of the United States. He left his brother with orders not to attack the U.S. forces. The Prophet told his followers that the Master of Life would prevent the soldiers' bullets from hurting them. The struggle that followed was called the Battle of Tippecanoe. When Tecumseh returned, Prophetstown no longer existed. The American Indians involved in the Confederacy had abandoned it, and Harrison had destroyed it. Many of Tecumseh's followers, hungry and defeated, returned to their former villages. Tecumseh did try to recreate his confederacy, but he had only limited success. Tecumseh's dream ended in 1813, with his death at the Battle of the Thames, during the War of 1812. With Tecumseh's death, American Indian resistance in Ohio came to an end. American Indians in the state agreed to abide by the terms of the Treaty of Greenville. Over the next several years, various groups signed additional treaties relinquishing their remaining territory. By 1843, the last large group of American Indians in Ohio had been made to give up their land.